Local Live Sports Now Available Through Streaming Video Services! | Blog | Sail Internet San Jose-Fremont | Fast, Affordable Internet. I’ve been a Sling TV subscriber via my Apple TV for more than a year, and was thrilled to see NBC Sports Bay Area and NBC Sports California networks (formerly known as CSN Bay Area and CSN California) show up on my Sling TV program guide last week. The fraction of games not covered by the regional NBC Sports networks could already be streamed live (or were broadcast) from existing channels. I can now watch SF Giants games live through my Apple TV with the Sling "Blue" package. It’s a great deal at $25/month, as compared to the $110/month I was previously spending for a Pay TV package with hundreds of channels I never watched. The streaming video quality is not quite as good as it is through MLB.tv or broadcast HD, but adequate. The fraction of games not covered by the regional NBC Sports networks are mostly available on broadcast channels (NBC Bay Area or Fox 2) and some of the Warriors games are shown on the TNT cable channel. And all of these channels are also included in the Sling Blue package. I also subscribe to MLB.tv on my Apple TV to see out-of-market games such as the Chicago Cubs. Local A’s and Giants games are available with higher HD quality after a 90-minute delay (available for streaming 90-minutes after the last pitch). Eventually MLB.tv may offer live streaming, but not yet. 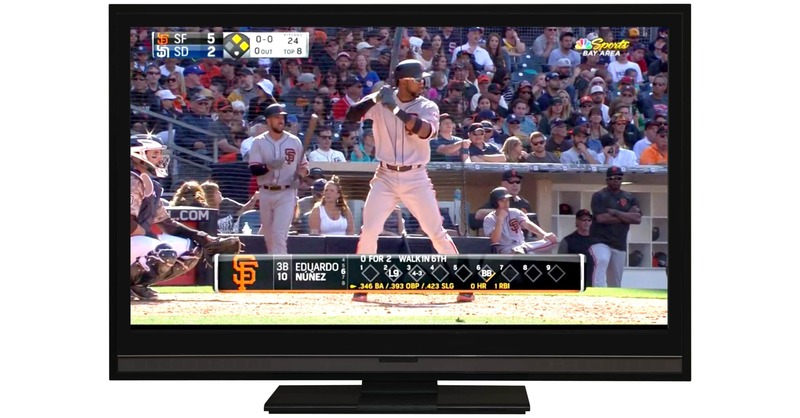 The regional NBC Sports Bay Area networks are also available through streaming video packages from DIRECTV NOW, PlayStation Vue and upstart fuboTV and expect more to come. DirecTV NOW has excellent HD Video quality (better than Sling), but the package that includes live local sports is a hefty $50/month. The PlayStation Vue package that offers live local sports networks is $45/month, and also requires that you have a Playstation streaming device. fuboTV has decent HD video quality and offers a virtual DVR feature for later viewing of games from within the app, however fuboTV currently does not offer any packages that include the popular ESPN sports network. None of these streaming services require a cable TV subscription or a long-term contract — so you can cancel at any time. Except for Playstation Vue, these services stream using apps on popular streaming media players such as Apple TV, Roku and Amazon Fire or straight to your laptop computer. With more and more consumers dropping their expensive cable bundles, it was just a matter of time until local live sports would be available for streaming! With this shift, there is no remaining reason to subscribe to an expensive Pay TV bundle. Read more about streaming video services and devices at our updated Sail Cord Cutting Guide.